Serve these cod wraps with mashed potato flavoured with parsley and Dijon mustard, or on a bed of rocket, drizzled with Greek yogurt. Preheat the oven to 220°C, gas mark 7. Season the fish with freshly ground black pepper and spread with the pesto, about 1-2 teaspoons per fillet. Stretch each rasher of bacon using the back of a knife. 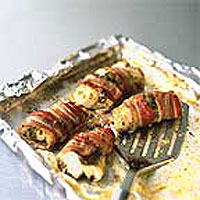 Wrap each piece of cod in 2 rashers, avoiding any overlapping. Place the cod on a baking tray lined with aluminium foil. Brush with the olive oil and bake in the oven for 12-15 minutes, or until the fish is just cooked and the bacon is crisp. If necessary, place briefly under a hot grill to crisp up the bacon. As with all fish, keep a close watch on the cod as it cooks: 5 minutes too long and the flesh will become dry. Frozen cod is sold by weight so the number of pieces in a pack sometimes varies - if you have more than 4 pieces, simply pair 2 smaller pieces to make 1 large portion.